Ham and Cheddar Stromboli is a recipe from my friend Shelly. Originally from Cooking Light, Shelly recommends it as a good food gift for new moms. It’s a good source of protein, can be eaten with one hand, and it can be cut up and frozen in individual portions. The original recipe was designed for a bread maker, but I made the dough with my stand mixer and dough hook. It’s incredibly easy to work with, so if you think you are a klutz with dough – no worries here! Also, consider the amount of fillings a suggestion and stuff it with as much meat or cheese as you want. Since I don’t have a huge crowd to feed, I served everyone a sample, cut the rest into slices and wrapped them individually. Fuzz will be eating this all week, I suppose. Of course I’m all ready to try a new variation. 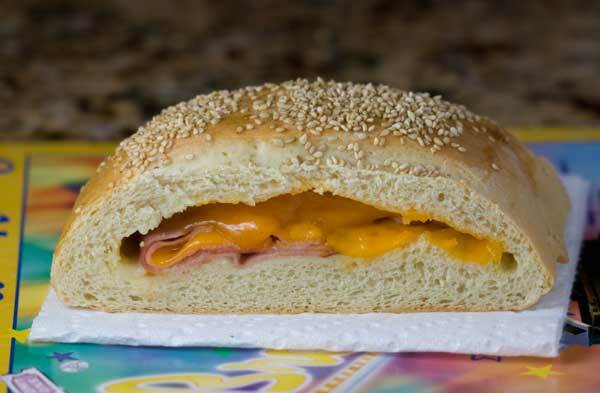 A roll filled with ham and cheese. Sprinkle the yeast over the warm water and let proof until bubbly. Combine the flour, salt and milk powder in the bowl of a stand mixer. Add the yeast mixture and the olive oil and stir until dough comes together, then put the mixture under the dough hook and knead until it is smooth and elastic. Put the dough in an olive oil coated bowl and flip it around to coat. Cover and let rise for 1 hour. Punch down the dough and on a floured surface, roll it into an oval about 10 x 8. 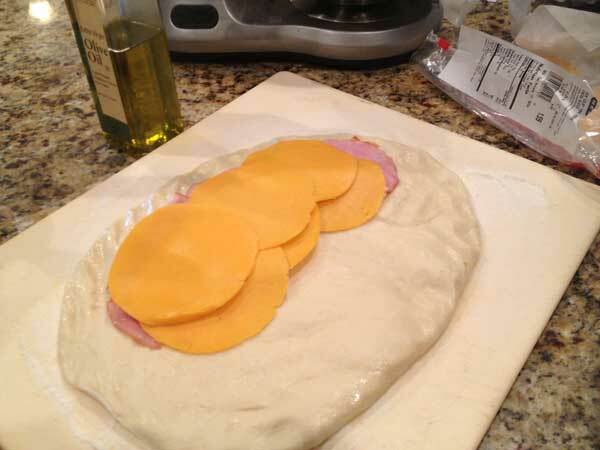 Lay the ham and cheese across half the dough, leaving a 1 inch border. Fold dough over filling and press edges to seal. Transfer to a parchment lined baking sheet. With a razor blade, make 3 or 4 cuts across the top. Let rise for another hour. Before baking, brush with egg and sprinkle with sesame seeds. Bake at 350 degrees F. for 35 minutes. Let cool for about 10 minutes, then cut into 8 slices. The variations ought to be just about endless for this. Yes, Carole, I am snowed/drifted in too. Waiting on a big tractor blower to come. Going to try this for dinner. Have a package of Rhodes bread dough in the freezer, Everything else on hand. Not as good as homemade bread but we are snowed in and have to make due with what we have on hand. That looks delicious! My sister-in-law makes something similar (with pepperoni, marinara sauce, and cheese) and sends it along when her children are weekend guests at a vacation home. Everyone can dig right in as soon as they arrive at the destination, or it can be enjoyed throughout the weekend.